What a day! Instead of just writing about an exciting new running event, we put ourselves right in the middle of it. 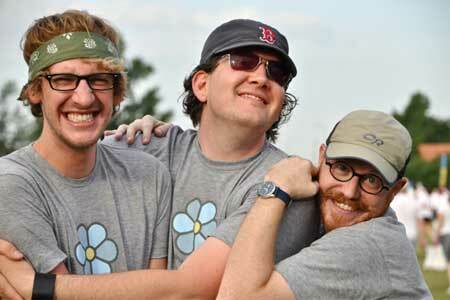 The crew from DietsInReview.com participated in the increasingly popular Color Run over the weekend in Tulsa, OK. This event was unlike any other running event, or any other event, period. I’ve been in huge crowds at running events before, but not like this. 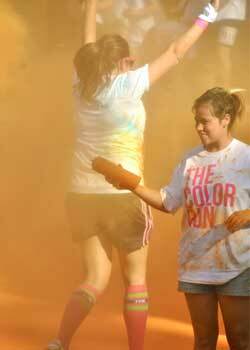 It’s reported that the sold-out Color Run in Tulsa had 10,000 participants! “Team DietsInReview.com” consisted of myself (Lacy Hansen), Brandi Koskie, Dana Shultz, and even my 8-year-old-son Judah. Among the sea of white shirts were our faithful husbands sporting grey DietsInReview.com shirts and pumping up the crowd by passing out our signature cowbells. At race time our foursome lined up at the jam-packed starting line to run (and walk) the un-timed 5K that promised to return us covered in all the colors of the rainbow. We ran in the third wave, as they only let about 1,000 people go at a time to reduce congestion. While we waited the tunes were being pumped and the “festival captain” kept the crowd energized. Finally, we were turned loose, however it took awhile for any movement to take place as the field was stacked deep and very little jogging, let alone running, could take place for several yards. The instructions said to place yourself in the start according to your speed, but there was no way to judge where one wave began and another ended. The congestion was also a sign of how very unique this run is. It is billed as a “run” but the field contained more walkers and joggers, not runners. It was a very different demographic than a typical Saturday morning 5K. 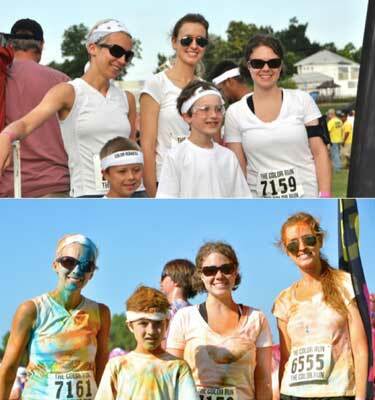 The Color Run included families, teams, and even bachelorette parties racing the 3.1 miles at their own speed. The “festival captain,” Johnny Patterson, told Tulsa World that the Color Run is meant to appeal to those who aren’t runners. And if that’s the case, they did just that. Among the 10,000 participants, it was amazing to see many who may had never entered an exercise event had the element of color and fun not been involved. I really loved that the fun took away the fear that competitive events seem to have. I was led through the course by my son who was so excited when we began to see a cloud of orange as we entered the first color station. “Coloring agents” puffed powder on us from squeeze bottles and sent us on our way. When the dust cleared we looked at each other slightly disappointed. We felt like we were just dusted, but we had gone to get totally covered. Some color stations were more accommodating than others, especially the ones with small children as volunteers. Other stations were a little stingy and insisted we “move along, don’t slow down.” However, all volunteers had fantastic attitudes and kept the music loud making the whole course a party. Since the route was mostly run on one single street with a turn around, you were passing those ahead of you on your way out and those behind you on the way in. It was a great vibe and littered with smiles the entire way. After our final color station we charged the finish line. There was no timer but plenty of volunteers who gave high-fives and ushered us into a huge dance party. Our team joined the fun; especially Dana who was plucked from the crowd to participate in a dance contest on stage. She danced her heart out to win a new pair of shoes, but the crowd chose an adorable rainbow-colored second-grader. We couldn’t blame them! The dance parties were actually “color throws.” Every 20 minutes the newest set of finishers would join the crowd and on command the entire crowd would toss a packet of color. A giant rainbow plume went up in the air. You could hardly see your hand in front of your face, and some even got choked up, but the end result was that we were all drenched in color from our scalps to our toes. If a runner hadn’t gotten covered in the run, this did the trick. 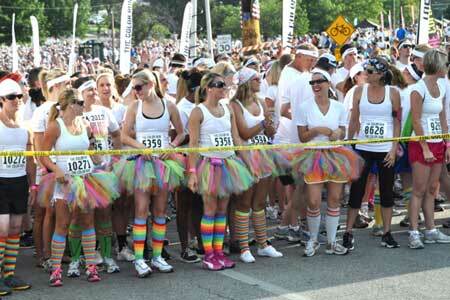 The Color Run is scheduled to stop in more than 30 cities this year. The coordinators partner with each city and agree upon a local charity to support. 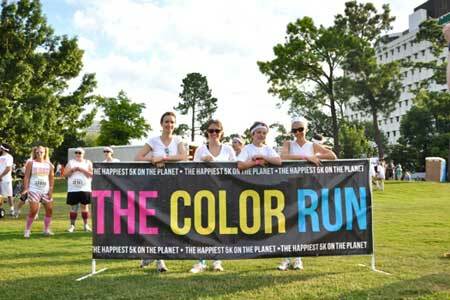 Tulsa’s proceeds went toward the River Parks Authority and the director of that group worked hard to get the Color Run to the city. The Parks Authority should receive about $20,000 from this event. Not knowing what to expect, we were all pleasantly surprised. It does my heart good to see people sweating and smiling on a Saturday morning. Our team definitely had fun; I think we were laughing and smiling the whole day! We left the Color Run with a fantastic memory we’ll always cherish. This event is not going to replace competitive runs, but it’s going to open the door for more people to get off the couch. 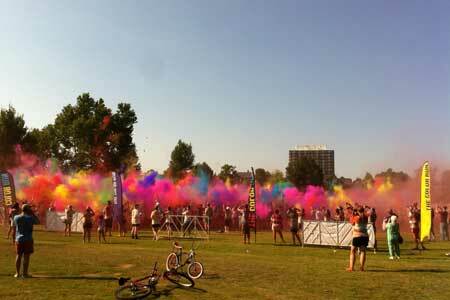 Well done Color Run, well done. I don not like this product this company advertising is fake. Karolyn had a bad response to this bogus supplement with problems in digestive system and had a problem delivery.